BLH: What inspired you to start a book club? TJ: It stems from my observation that a lot of readers don't live in major cities. Many readers who appreciate African American literature covering a wide range of topics live on military bases, in the UK, small Mid-Western towns, etc. There was and still is a need for readers to communicate and share ideas. During the internet's commercial infancy, I built websites. Eventually I decided to build my own site. As soon as I put aalbc.com up, I started selling books and earning a commission. Helping readers find quality literature large booksellers overlook meets a need I take pleasure in fulfilling. BLH: Was the venture tougher than you imagined? 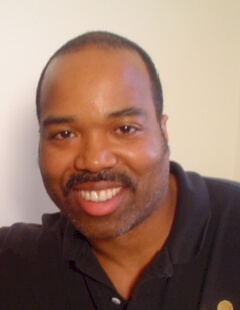 Feature Interview with Troy Johnson, founder and owner of the African American Literature Book Club (http://aalbc.com) - one of the largest book sites on the net. A site that gets more than 100,000 visitors each month! Troy holds a BS in Electrical Engineering from Syracuse University, an MS from Polytechnic University and an MBA from New York University's Stern School of Business. TJ: I had no preconceived notions when I started out, so I can't say that it's been tougher than I imagined. I will tell you that if you do what you love, the financial reward will come as we make sacrifices for love we wouldn't make for any other reason. BLH: What's necessary for a book club to be successful (i.e. involved members, good communication with publishers and authors, etc.)? TJ: An online book club is different than an offline club. With an offline club, if members don't show up, the club will fail. Online - I can be in a hotel in Japan or in my home in Brooklyn and pull off a chat with a bestselling author. Talented writers, staff and our club members communicate day and night. There is no fee to become a member of AALBC. We host author chats and book discussions. Key to an online book club's success is having a strong, in-the-know facilitator. Anyone with a PC and an internet connection can participate in our events. No one has to cook, bring a snack or drive to our meetings. I have also found that the anonymity of an online book club causes readers to be more vocal about books we vote to read. BLH: Do you plan to create an offline club as an extension of AALBC? TJ: If there was a group of readers who met through AALBC and decided they wanted to have an offline meeting as an off-shoot of AALBC, I wouldn't mind. However, I have no personal plans to create an offline club. I do receive lots of email from readers seeking to connect with offline clubs. I direct them to offline book club presidents. I also participate in offline panels and workshops. Just this past week I returned from BEA in Chicago where I spent several days networking. BLH: What are some of the benefits of being a member of AALBC? TJ: We provide a place where readers can go to learn about new books. We receive books from large houses and independent publishers. We strive to make quality books, be they from large houses or self-publishers, readily available to our members and site visitors. We provide members and visitors from small towns absent large booksellers a place to come to learn about books they wouldn't otherwise be aware of, books they can purchase at AALBC at a lower price than they would from another bookseller. We also make out-of-print titles available to our members and visitors. BLH: How can authors and publishers reach you to inform you of new titles? TJ: Contact us via our site. We put up author bios, excerpt pages, photos, etc. We work with small publishers to get them exposure. BLH: What steps can authors take to increase their chances of having their title picked up by book clubs, particularly specialty and large clubs? TJ: There are roughly 1100 books published a week. It helps if authors are approachable and personable. Be persistent. Be tenacious. Don't wait for the publisher to promote your book. It's been my observation that authors who sell lots of books gain the attention of book clubs. These authors are writers who get out and hustle. Authors who create a demand for their book. Eric Jerome Dickey, Omar Tyree, etc. - these authors continue to sell because they continue to push and promote their titles. BLH: What's involved in running a successful online book club? How much time do you put in toward the club? TJ: To be successful online, a book club should have, at the least, monthly author chat sessions. We are striving to accommodate more authors and will therefore, offer more chat sessions, some in interview format. Discussion boards allow members another vehicle through which they can communicate with one another. We have a poetry discussion board and are creating a poetry book club. We work hard because we love books. I put in 40 hours a week easily on the site. This year we have had well over 100,000 visitors a month. It's a number that continues to go up-up-up. BLH: Has the quality of the writing you're seeing improved, remained the same or weakened? Are you seeing more thought provoking books or do you notice that many writers mimic the writing in previous bestsellers? TJ: Anything successful will be mimicked. It is my goal to promote quality literature. I have noticed that although readers state they prefer literature they actually purchase commercial books. On the other hand, because of the internet, it is easier to find out-of-print books and quality, non-bestselling fiction. For example, readers can discover the talent of John A. Williams due to the internet. He recently released a book titled "Clifford Blues", a well written book without a mainstream, commercial slant. BLH: What advice would you give someone thinking of starting an online book club? TJ: To insure success on the net, you must continue to promote. Keep your site current. Change and expand, deepen your site's content daily. Keep discussions fresh. Bring new titles to your site on a regular basis. Give visitors and faithful members reason to keep coming back. BLH: What final remarks would you like to leave with our subscribers? TJ: The goal of AALBC is to inform readers about books and authors a profit driven environment would not tell them about. This should not be a time when John A. Williams is almost an obscure author. This should not be a time when we rely on Oprah to push a book. With today's technology, there is no reason a reader/author/publisher/editor/agent/book club president with a strong love for literature could not have a powerful impact on the book world.